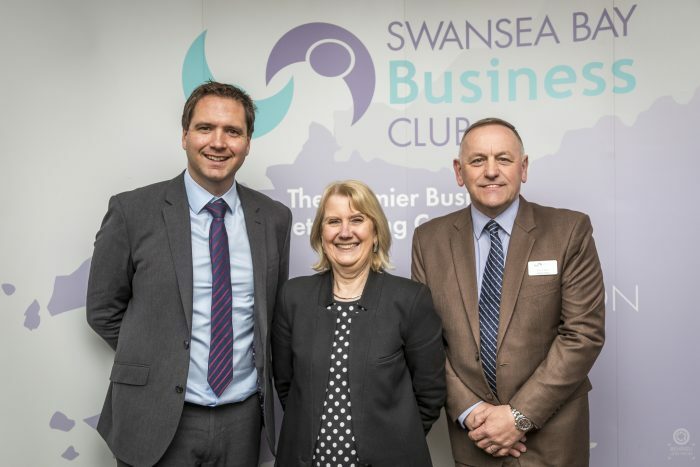 Swansea Bay Business Club held its first networking event after its traditional summer break on Friday at the Liberty Stadium in Swansea. Guest speaker Chris Jones, chief executive of Welsh Water, joined over 100 attendees at the lunch and spoke at length about his career journey and his long term visions and plans for the future of the Welsh water industry. Chris spoke to guests about the history of Welsh Water and how it came to be the only private but non-shareholder water provider in the UK as well as discussing some of the pioneering techniques they have adopted in his years at the organisation to help avoid issues such as droughts and flooding. Prior to the event the business club also hosted a session with Tidal Lagoon Power CEO Mark Shorrock, at which members and their guests were able to hear about the plans to press ahead with the Tidal Lagoon and participate in a Q&A with Mark, discussing many of the issues surrounding the plans. Paul continued: “As a business club we take pride in offering our members a platform to connect, learn and grow as businesses and we are always looking at ways we can improve this by offering more than just our monthly networking lunches. The Tidal Lagoon session and the Bank of England briefings are prime examples of how we are helping the business community to voice their opinions and hear the facts about some of the most important business issues first hand. Tickets to Swansea Bay Business Club’s Beaujolais and Christmas lunches cost £40 each for members and £45.50 for non-members. This will include a three-course lunch. Both events are being held at the Marriott Hotel in Swansea on November 15 and December 14 respectively.